Can you hear my heart beating quickly? I remember this feeling – kind of scared – very excited – a little anxious. When I was in 7th grade, we made an apron in home ec (short for home economics – the class all the GIRLS took so they would know how to cook and sew…BOYS took woodworking so they would know how to…build a log cabin?). Each student received a piece of material and a pattern and instructions on how to proceed. It took a great deal of courage to make that first cut, knowing that if you did it incorrectly, your finished apron would look ridiculous. I’m sure artists feel the same way when their hand hovers over a clean blank canvas. As I hover over this new project and lay out the template for future posts in the ‘WILL WRITE FOR COOKIES’ series, I experience those same feelings. My vision is to provide insights and information from experienced authors and illustrators – my hope is that you will find these posts educational and entertaining. Lucky for me, the award-winning, multi-talented children’s author and illustrator, Iza Trapani, graciously agreed to participate. I’ve gotten to know Iza through her wonderful picture books and her warm and generous comments on many kid lit blogs. Kids have an innate curiosity that drives them to always be asking WHO? WHAT?, WHERE? WHEN/ and WHY? So here, without further ado to answer those questions AND to provide us with a recipe for a treat that is guaranteed to excite your taste-buds, is the lovely Iza! WHO? Who were your favorite authors/illustrators when you were a child? I immigrated to the U.S. from Poland when I was seven years old. 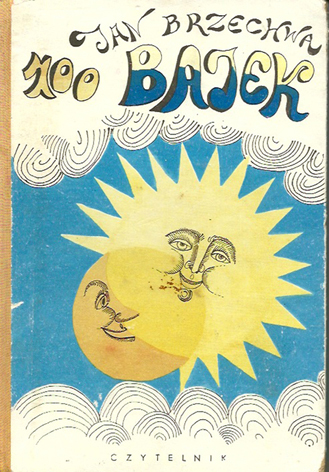 One of my favorite books was a collection of poems called Sto Bajek (100 Tales) and I still have a copy! The author was Jan Brzechwa and his poems were full of Seuss-like humor and hyperbole. The wordplay, tongue-twisters playful language and clever concepts never ceased to delight and amaze me. One example is a poem about a group of animals pondering over the existence of holes in a hunk of Swiss cheese. As they theorized, they suddenly noticed that the cheese was gone. A crow had swooped down to eat it, telling them that they were more concerned with the holes in the cheese, than the cheese itself, so she ate the cheese and left them the holes! That just blew me away! Though I did not experience many picture books as a child in America, I have certainly made up for it as an adult! WHAT? What do you know now that you wish you had known when you first started writing for children? Great question! First of all, I wish I had known that children and early educators are not scary at all. I used to be painfully shy, but I soon discovered that once I was published, I was asked to do school visits and to present at conferences. It was really hard for me. I could barely get up there and say my name- never mind do a whole presentation. But over time, I learned that my audiences were always kind, receptive and supportive. They admired what I did and wanted to hear all about it. Twenty plus years later, I have turned into a complete ham 🙂 and am not the least bit worried about being the center of attention. What else have I learned? Not to be attached to my words. I used to consider my early writings precious. I hated taking out parts that I was attached to. Now I have learned that there is always a way of saying something differently, and usually it’s an improvement. I adore the editorial process, of having another set of eyes and I have no problem of doing complete revamps of my manuscripts. When I look back at some of my early stories that I considered so dear, I find much fault with them. These days, I am my own worst critic. As soon as I finish a book, I think of all the ways I could have made it better. With each book I strive to perfect my craft- but I am rarely satisfied. But I guess that’s part of being an artist- that constant struggle to grow and improve. Not a bad thing, really. WHERE? Where do you like to write/draw – inside, outside, a special area in your home, on the computer, in a notebook? I have lots of writing spots at home: In my studio- at my husband-built desk (Rob is a furniture maker) or in a comfy chair, or in a wicker love seat on my studio terrace when the weather is nice. Or on the living room window seat, or the couch by the fire in winter. But ultimately, it doesn’t matter where I am. While working on a story, I am completely immersed and the surroundings are irrelevant. I used to have a romantic notion that if I sit in a special spot the muse will join me, but that is rarely the case. I can’t just sit down and shove a story out. Story ideas usually appear on their own time- usually when I am in the midst of struggling with a different draft. When I do have an idea, I do much of my brainstorming in the shower, in the car, on walks. Walks are great for problem solving. I always have a small pad or my iphone with me to jot down or record notes, and I often write my first rough drafts on paper, but then I do the bulk of the work on my laptop. As for the art, I sketch in various spots as well, but mostly I work at my Rob-built drafting table in my studio. WHEN? When during the day (or night) are you most productive? Do you set a schedule for working or do you write/draw when the muse speaks? Typically, Rob brings up a tray of coffee and toast to bed early in the morning (I do count my blessings!) and we read for a while. I also use this time to do some social networking (and play a few games of FB scrabble- because I am addicted :-)) Then I will take the dog for a hike or jog on our farm, or go to a Pilates class, pick up some groceries while I am in town, and after that I will spend the rest of the day in my studio, either working on text or art, or both. Once I am in my studio, it’s hard for me to leave. I spend a good deal of time revising and fine tuning my stories. The illustrations are especially demanding and time consuming. Laying out the book, developing the characters, making sure they are consistent from page to page, working out the colors and design elements are all big challenges. But this is also my passion, and I am so grateful to be doing what I love! WHY? Why did you choose the nursery rhyme ‘Little Miss Muffet’ as the basis for your picture book manuscript? My editor noticed that I had quite a few positional and directional words (up, down, over, under, etc…) in my draft, and she suggested that I add even more. That was hard! I had to make some major revisions to incorporate those words while working within the restraints of rhyme and meter. But I love the word-tweaking, puzzle-solving process. Iza, please feel free to share any tips that will help aspiring writers/illustrators. Pursue your dream actively and don’t be discouraged by rejection. It’s part of the process. Read, write and/or draw a lot. Be critical of your work and strive to make it as good as it can be. Read your stories out loud to make sure they flow. Read and study the books in your genre. What makes them good? Or maybe not? How would you do it differently? 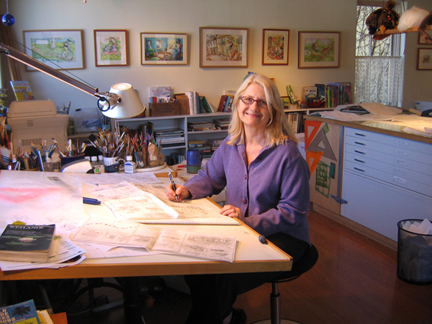 Join SCBWI http://www.scbwi.org Read books and blogs on the craft of writing and illustrating. There is a wealth of information out there. The Purple Crayon http://www.underdown.org is the very useful site of editor/author Harold Underdown, who wrote The Complete Idiot’s Guide to Publishing Children’s Books. It’s a great resource. http://izatrapani.com/wp/?p=469 So You want to write a Picture Book? http://izatrapani.com/wp/?p=472 So You Want to Illustrate a Picture Book? In a mixer, cream 1 stick of softened butter. Slowly add 1 cup flour and 1/2 tsp salt. Add 1 TBS vanilla extract. Add 1 cup somewhat finely chopped pecans. Wrap the dough in plastic and chill for one hour or more. Place on cookie sheets about 2 inches apart and bake for 30 minutes. In the meantime, sift 3/4 cup of confectioners’ sugar onto a plate (or work surface). When cookies are done baking, remove from the oven. While still warm, roll them in the confectioners’ sugar. Let them cool, and then roll again in the remaining sugar. Thanks so much for this interview, Vivian! Oh my goodness, Iza…thank YOU so much for sharing all of this! I know the resource links will be super helpful to everyone. Your answers to the questions were fascinating! 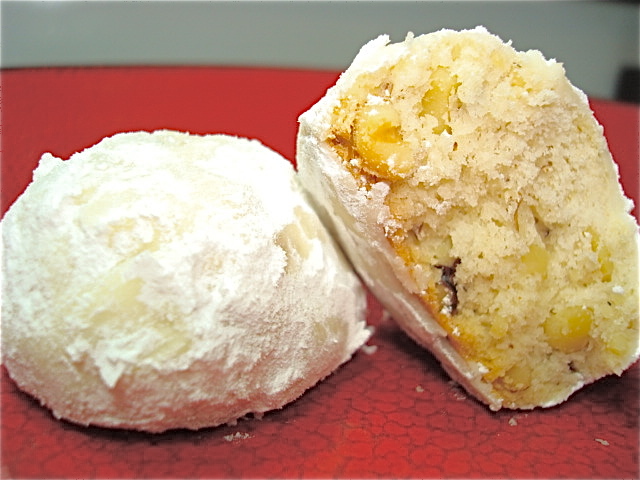 And the butter balls…my grandmother used to make those…I’ll bet many of my readers will be trying them this weekend! I hope you enjoyed the first in the ‘Will Write for Cookies’ series. Please come back on Saturday, November 16th, to meett our next distinguished guest, founder of the ultimate picture book resource, Perfect Picture Book Friday and author of Can’t Sleep Without Sheep and many other picture books, Susanna Leonard Hill. This entry was posted in Author/illustrator interviews, Cookie recipes, Will Write for Cookies, Writing tips for children's authors and tagged Author/illustrator interview, Cookie recipes from authors and illustrators, Iza Trapani, Jan Brzechwa, Little Miss Muffet, Picture Book writing tips by viviankirkfield. Bookmark the permalink. Terrific post, Vivian. Excellent interview, and already I’ve decided to make a batch of the butter ball cookies for our neighborhood “Autumn Cookie Swap” next weekend. Plus, you’ll be pleased to know that now the schools have co-ed auto-mechanics classes, woodworking and metals shops…and there are almost as many males as females in the Self-Sufficiency Foods Class! Now THAT’s progress! Thanks, Marilyn! The cookies will be a hit! Love this new series. Thanks for the tips and inspiration Iza. Thanks so much, Stacy- and thanks for sharing all over the place! This is such a wonderful post — and a great start to what promises to be a fantastic series. Thank you, Vivian, for having the idea to do these posts, and for facilitating them. Thank you, Iza, for letting us into your world a bit, and for all those fabulous links. I will savor them all. But how are we supposed to wait an entire month for the next “Will Write for Cookies” post? Beth, we could make a batch of those butter ball cookies every day for a month until the next post. Sounds loke a plan to me. Again…sounds like a PLAN TO ME! Yummmmmmm. Thanks, Beth! I am glad you enjoyed it. I can’t wait till next month either! I really appreciate your kind comments, Beth! I was so fortunate that Iza was willing to give so much of her time. I originally wanted the series to be a weekly one…but I’m not sure I had the time to commit to that. It is definitely something I will work towards…and getting authors and illustrators to hop on board is the other piece of that puzzle. Thanks for being so supportive, Beth! That’s the spirit, Beth! 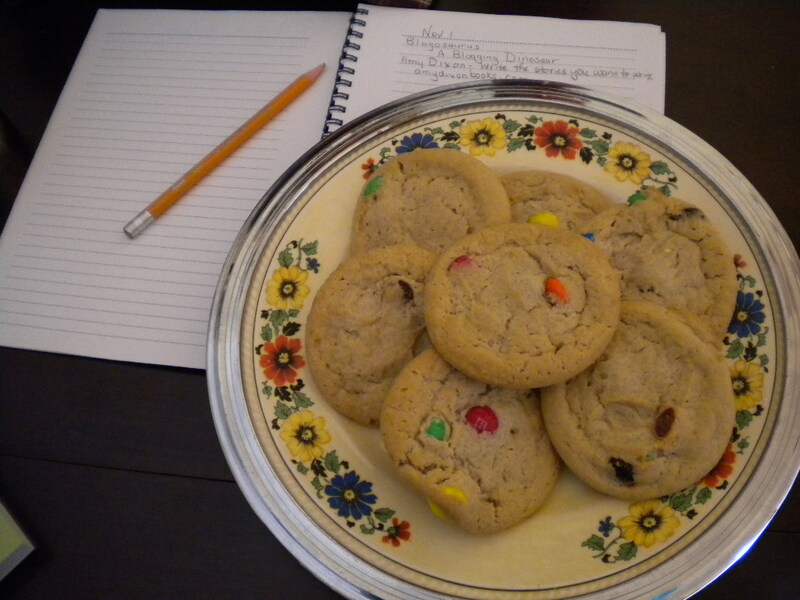 I look forward to reading your entry in the Will Write for Cookies series! I love how you have found a very cozy niche with your books. They are so wonderful for young children and I give them as gifts. It troubles me when I hear young children singing pop music, when they should be learning more age appropriate songs and stories. That’s why I like to introduce young moms to your books. Lovely interview. And, I love the desk too! When we were in school, we had to learn so many poems and songs…this type of learning is so important. I agree with you, Pat…Iza’s books are wonderful for young children…they bring back those nursery and Mother Goose rhymes in a new and exciting way. Fun series, Vivian. I enjoyed getting to know more about you, Iza! 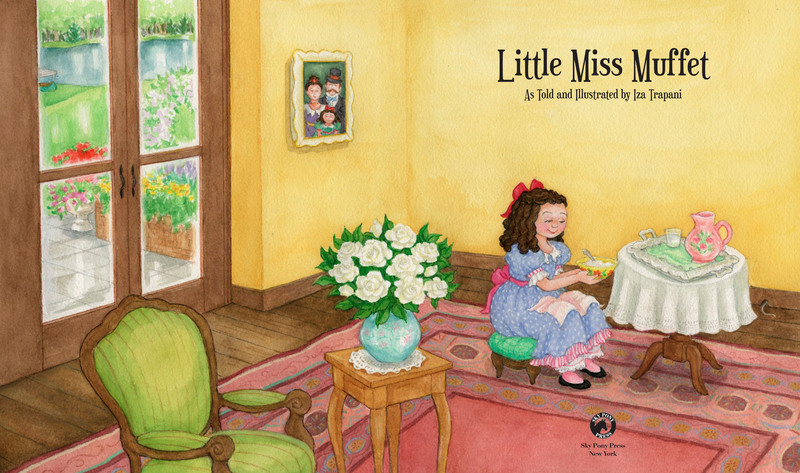 That spread of Little Miss Muffet is beautiful! Vivian, thank you so much for featuring me in your wonderful new series! And thanks everyone for your kind comments! The cookies are really easy, foolproof and delicious. But we certainly would be butterballs if we ate too many! Thank you again for your generous gift of time and expertise! Great interview, Iza and Vivian! What a way to kick off the series! I love all Iza’s wonderful tips, and that recipe looks like something I will have to try immediately 🙂 I’m so looking forward to reading future entries in this series! I am looking forward to reading yours next month, Susanna! Thank you for the kind words, Susanna! It’s easy to have a great interview when the person being interviewed shares so generously and writes so well. :) I’m looking forward to connecting with you here next month! I think we all like Ms. Trapani’s desk, Erik! And I’ve noticed that every culture has similar foods…they just call them by different names. 🙂 I’m glad you enjoyed the interview…Ms. Trapani shared some great writing tips. Having a handy person in the family is definitely…handy. :) Thanks for stopping by, Nancy…Iza shared great resources for writers…and I do love her workspace! Wow! I just want to pop over and give Iza a squeeze! What a great post, so intimate, informative and inspirational. And I’d also like to see more of what Rob built! Gorgeous! Thanks for including all those links too, I’ll be studying them. And a toast to Vivian for bringing us this new series! Yay! A lot of my best ideas come in the car. I just try to keep paper handy! Thanks to you for the great questions and a fun new series, Vivian! Have fun reinventing your new workspace! I’ll squeeze you right back, Julie! (you too, Vivian 🙂 I am so glad Rob’s work is admired here. He really is an amazing artist. To see more of his work, you can go to http://www.robhare-furnituremaker.com Thanks! Haha, great line for the long road! Love this post! I cannot wait to make (and eat) these cookies :). Every wonderful writer talks about reading :). Reading is not just a necessity for us, it is my favorite perk as a writer. Thanks Iza and Vivian! I agree about the perk of reading…I loved picture books as a child…and never outgrew them. Now I have the best excuse for reading them…RESEARCH! Yes, reading is definitely a perk! And picture books are timeless. I find most adults enjoy them as much as kids! Thanks Sheri! I’ve already learned so much from Iza, and yet here she is, giving me even more tips and insight — she’s a bottomless well! And I’m so glad about that. Thank you, Vivian, for kicking off your great series with Iza. And thank you, Iza, for your continued wisdom and support. A great post! P.S. Your husband is a genius. 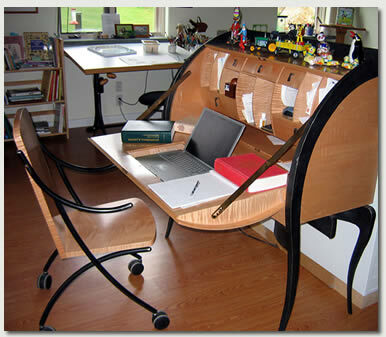 I have never seen such a gorgeous desk and chair! Hi Renee…yes indeed, we are all so lucky to have generous people like Iza who share their writing journey which benefits us. 🙂 This is an amazing kid lit community…I’m always blown away by how helpful and caring everyone is. Oh Renee, I am so happy to hear that! Thank you. And I have learned from and been so inspired by you, my friend. And that goes for you too, Vivian, and everyone here that I know. What a wonderful online community of support and learning we have! And Rob is delighted with all the praise he’s getting! Thanks! Iza, what a thoughtful and YUM post. Loved reading your tips as always. You are now and will forever be my BBF. You give so much back. There aren’t enough numbers in the world to count what I’ve learned from you. And you’re just like the Energizer bunny only you keep on givin’ (instead if tickin’)! WHAT A BEAUTIFUL DESK!!!!!!!!!!!!!!!! My dad was a wood maker. He made the most beautiful furniture. I can see your hubby is a fantastic wood maker too. Thank you so much for this interview. I was very disappointed to see that Sto Bajek is only in Polish… maybe Iza should translate it. It sounds hilarious! Hi Beverly! Sto Bajek is truly hilarious, but poetry is so hard to translate… I like your idea, though! Super interview Vivian! Iza I love your working environment, it is lovely. That recipe sounds divine as do your stories. Thank you, Catherine! I am so glad you enjoyed it! Yes, I am very lucky to have a great working space. A GREAT start to a fun new project! Well done Ms Kirkfield! It’s fun to learn more about Ms Trapani. Thanks for sharing !!! Thank you so much, Rhythm! How wonderful! I love getting to hear about other artists’ processes. Such a great interview! That has been one of the hardest things for me as a writer…to realize that story ideas take their time! It helps to hear it from you, Iza. You have so much experience. The cookies look and sound delish! I can almost smell them! Awww! Just sifting (belatedly) through my emails! You’re very sweet, Vivian. And, yes, I did enter the Halloweensie Contest 🙂 And I always look forward to your entries. I love your Halloween Dance Party Countdown…soooo cute and well written! Penny, thank you! I am so glad those lines resonated with you. It took me a while to figure that out. Still, that’s not to say we shouldn’t sit in our favorite spots and write and brainstorm, for a story may start to form. But in my experience, ideas for picture books are quite elusive. They do come on their own time- but perhaps they wouldn’t have, had I not sat in the chair and struggled beforehand! And I can’t stop admiring her beautiful desk! Her husband is very talented. Her huge drawing table is awesome too! Rob and I both thank you! You’re welcome. You really have an amazing work studio. I hope I can produce enough revenue from my passions one day to dedicate a whole room of my house for them. I hope so too, Milka! Thank you, Milka! And my husband thanks you too! Vivian, I try to keep the desk uncluttered ,as shown in the picture, but it doesn’t last long! But I do love neat and clean spaces. I love them as well = but can’t seem to keep up with the ‘paper’. Every surface seems to drown in it. 🙂 Wish I knew the solution. Same here! Paper, paper everywhere and not a spot to work! I like your series idea. Lucky Iza gets to be your first guest. And to Iza, I also enjoy reading about your writing and art journey. And thanks for all the links. I’ll be going through them as one day I’d like to illustrate my own books as well. And “Little Miss Muffet” was a treat to read. Thanks so much, Tracy! I’m thrilled so many people responded positively when I asked if they would take a spot. I’ve been MIA from blogging for a while because of our move…I’m slowly getting back into it. Tracy, thank you! Yes, I feel honored to have started off the series. I look forward to the others! I am so glad the links will be helpful to you, and feel free to ask me any questions. Good luck in pursuing your dream! And thank you so much for reading and enjoying Miss Muffet! Vivian, we all need to step away from blogging at times. I know I have had to as well. Iza, yes I took the time to write down the links and I will be referring to them to help with my illustrating, and thank you for offering to help.